“The way I was living stopped working for me.” An Interview with Chuck Hagele. Emotional maturity is a topic that touches every important part of our lives. My friend, Chuck Hegele, leads an incredible ministry to families with at-risk youth called Project Patch. 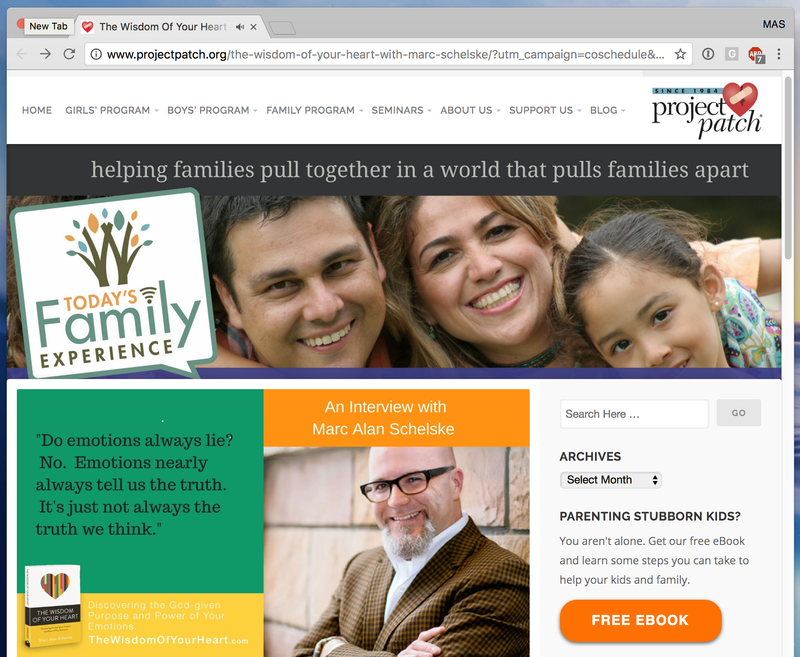 As a part of that ministry, he produces a podcast for parents called Today’s Family Experience. He and I spend about an hour this week talking about The Wisdom of Your Heart and it’s implications for ministry and parenting. Check it this great recorded interview. The way I was living worked for me through college. It worked through my singlehood. It worked through the early years of my marriage–it really wasn’t working in my marriage, but I thought it worked for me…It seemed like things were going well… When more and more layers of responsibility and emotional complexity were added on, that’s when I got stretched. I got to a place where I could not bear the burden that I had… I didn’t know what to do… I ended up in a place of deep depression, lots of anxiety, emotional brokenness in relationship with people that are close to me. That was all a fruit of not being equipped to handle and process what was happening for me emotionally.